The end of spring and the beginning of summer brings graduations at many levels. Whether the student in your life is finishing middle school, high school or college, money is a common gift for graduates. However, how much you should give is debatable. If you're wondering about how much to give for a graduation gift, you should consider first what you can afford and then your relationship to the graduate. There is no specific amount that etiquette dictates is appropriate for a graduation gift. However, there are some guidelines from experts to help you make the choice. A middle school graduation isn't an event that tends to get as much hype as a high school or college graduation. However, some students are beginning to send out announcements letting friends and family know that they are heading to the next phase in their education. In that case, it makes sense for parents and grandparents to give a gift to acknowledge the accomplishment. Great!Schools.org suggests giving movie passes, spa vouchers, gift certificates or spirit wear to middle school grads rather than cash. If you are giving cash, $10-30 is appropriate. How Much Money Do You Give a High School Graduate? While these are general guidelines for what to give, the giving is truly based on your own discretion. When you consider giving a gift of money, you'll want to take into account your personal finances and how much you can afford. If you are on a fixed income, you might give less. On the other hand, if you have disposable income, you might choose to give more. The situation of the graduate also needs to come into play. Did the person graduate with honors at any of the different levels? This might be rewarded with a higher than average monetary gift. When you give the monetary gifts, you want to be sure that you do it right. You don't just want to hand a graduate a wad of cash while in their cap and gown. Unless you are getting creative, putting it in a card with a personalized message is best. Additionally, it's discouraged to give anything at the ceremony itself. This is because the graduate might lose it in the shuffle. Wait to give it to them at the open house if they have one or put it in the mail. If that isn't possible, wait until you can talk to them privately and hand them a card. Make paper money flowers out of the cash. Make a lei out of one-dollar bills. Blow up balloons with money inside. Make a money tree gift. Give away a calendar with money taped to each month. Give away a piggy bank with twenty-dollar bills stuffed inside. Roll dollar bills and arrange them to create a layered cake, secured with ribbon. Tuck money into school supplies, such as a pencil holder or notebook. 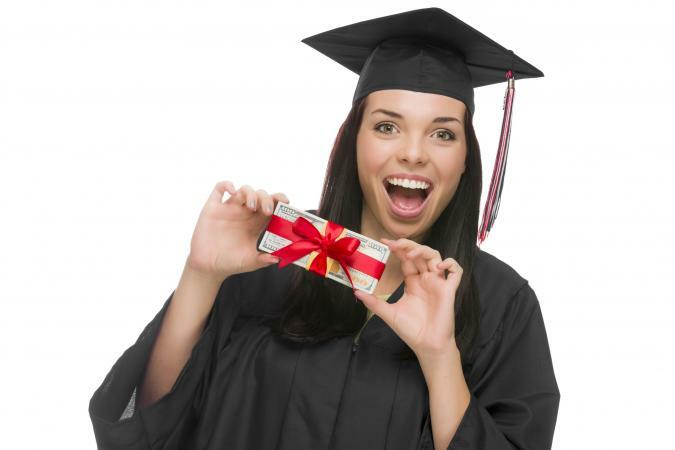 Monetary graduation gifts are an excellent idea with a lot of creative potential. Do something unique with your cash gift and make the presentation something to remember. Your graduating senior will really appreciate the gesture, no matter how much you give him or her.